(Nanowerk News) Positronium is a short-lived system in which an electron and its anti-particle are bound together. In 2007, physicists at the University of California, Riverside created molecular positronium, a brand-new substance, in the laboratory. Now they have succeeded in isolating for the first time a sample of spin polarized positronium atoms. Study results appear this week in the journal Physical Review Letters. Spin is a fundamental and intrinsic property of an electron, and refers to the electron's angular momentum. Spin polarized atoms are atoms that are all in the same spin state. A collection of spin polarized positronium atoms is needed to make a special form of matter, called the Bose-Einstein condensate (BEC). The BEC, predicted in 1924 and created in 1995, allows scientists to study atoms in a unique manner. 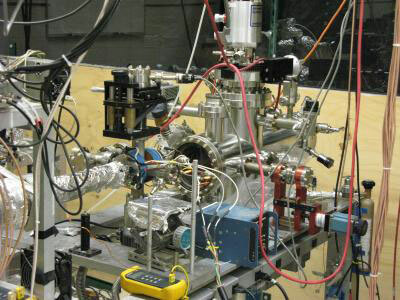 Image shows the ultra-high vacuum target chamber used in the experiment. "We achieved our result by increasing the density of the positronium atoms in our lab experiment," said David Cassidy, the lead author of the research paper and an assistant researcher working in the laboratory of Allen Mills, a professor of physics. "At such a high density, positronium atoms get annihilated simply by interacting with each other. But it turns out that not all the positronium atoms get annihilated under these conditions." Cassidy explained that positronium atoms come in two types – say, an up type and a down type. The positronium atoms are only annihilated when an up type meets a down type. Two atoms of the same type do not affect each other. "So if you have 50 percent ups and 50 percent downs and you squeeze them all together they will totally annihilate and turn into gamma rays," he said. "But if you have, for example, about 66 percent ups and 33 percent downs, then only half of the ups will be destroyed. You will get a load of gamma rays – but in the end you will be left with only one type of atom – in this case, up atoms. "This is an important development for making the BEC," Cassidy said, "because you have effectively purified your sample of positronium. And you need a pure collection of spin aligned atoms to make the BEC." When atoms are in the BEC state, they are essentially stopped (or they move extremely slowly), facilitating their study. Non-BEC atoms on the other hand whiz around at very high speeds, making them harder to study. "There are fundamental processes that can be looked at in new ways when you have matter in the BEC state," Mills said. "Having Bose-condensed atoms makes it easier to probe the way they interact under certain conditions. Moreover, to have motionless positronium atoms is an important aspect for making something called a gamma ray laser, which could have military and numerous scientific applications." According to Mills and Cassidy, the new research could lead also to the production of fusion power, which is power generated by nuclear fusion reactions. "The eventual production of a positronium condensate could help us understand why the universe is made of matter and not antimatter or just pure energy," Cassidy said. "It could also one day help us measure the gravitational interaction of antimatter with matter. At present, nobody knows for sure if antimatter falls up or down."